Home > Stories > Venturing out during the winter months? Your guide to staying safe and avoiding breakdown! Venturing out during the winter months? Your guide to staying safe and avoiding breakdown! 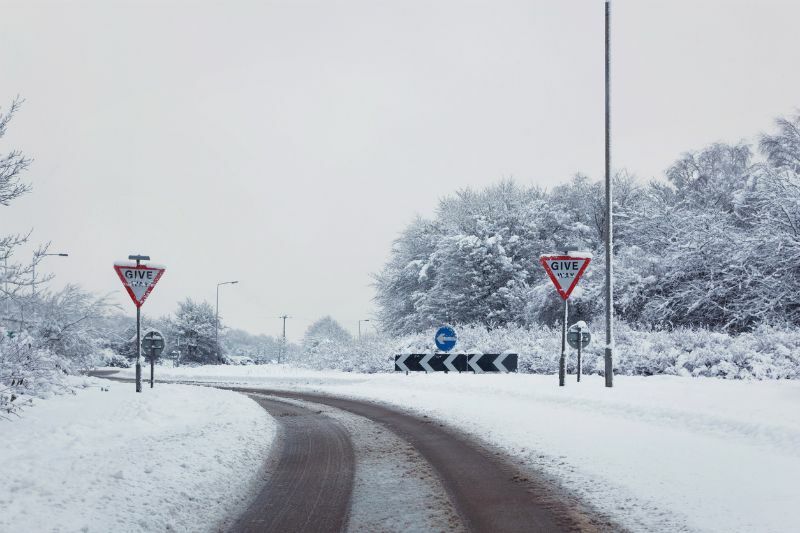 Winter is a challenging time for drivers, as the below zero temperatures lead to dangerous roads. Ice and hail are two hazards to look out for. However, preparing adequately and driving appropriately will help you stay safe. Speaking from a very recent experience it was only last week where we had some interesting weather and I nearly had an accident myself due to the slippery road conditions whilst coming of a motorway slip road. The sharp turn I had to take could’ve been disastrous had I not been familiar with the road and known how notorious it was for accidents. Expectation and driving smoothly are crucial for driving on icy roads. Look ahead for possible hazards such as patches of ice and keep your speed well down. Accelerate, brake, steer and change gears as smoothly as possible to reduce chances of skidding. A higher gear may be more appropriate to help you grip on compact ice. This helps manage engine power delivery, making it easier to find grip. If it’s a manual, you might need to slip the clutch a little to prevent the car from stalling. You will also find that many automatics will let you go into second gear at a standstill to pull away in. Your grip on you tyres is enormously reduced on icy roads and braking takes much longer. Even by avoiding an accident, your car could get stuck leaving you with a long walk home. Keep in mind traffic congestion is likely to be worse during the winter period too. Before leaving home, ensure you have a fully charged mobile phone and maybe a power bank with car connection, a bottle of water, a few snacks and a warm blanket. If snowfall looks likely, wear warm clothing and sometimes if you fancy going that extra mile then a high-grip fabric cover fitting over your car’s steering wheel is a good idea to have too. Let friends and family know your route and when you are expected to arrive. Clear your car’s windows and mirrors before setting off. Braking distances can increase 10 times your normal stoppage distance between you and the car in front. Your tyres grip less effectively in cold conditions. Sometimes investing in winter tyres in extreme situations can help. They will also help the performance of your car. Even if the temperature is above zero and there’s no ice on the road, you should still take extra care. Black ice is a very thin layer of ice on the surface of a road. Due to its smooth and transparent texture, it can appear the same colour as the road below it. Black ice is almost invisible to drivers, which can make it dangerous. Hail storms are extremely dangerous to drive in. Not only can they cause serious damage to your car but can also be harmful to anyone who decides to venture out of their vehicle as visibility is ever so little. If hail is severe, stop driving as and when it is safe to do so, pull over to a safe sheltered place (if you can) until visibility is clear again. Let friends and family know your intended route in case of an emergency. Breakdowns are more frequent in the winter and road conditions can be really dangerous, especially when snow and ice sets. No matter how well prepared your car is, you could be stuck along with everyone else due to someone else’s careless driving or misfortune. So if you’re driving, pack a winter emergency supply, just in case. Car batteries don’t really last longer than five years and there is usually a demand for them during the winter due to the excess usage of lights and windscreen wiper. Turn off all electrical appliances in the car such as lights, heated rear window and wipers before starting your engine. If the engine doesn’t start at its usual speed, wait 30 seconds. A continuous squealing noise when you start up probably means the water pump has frozen and it’s the fan belt slipping. Stop the engine straight away and let it thaw out until you think it’s safe to then get back in the car and drive. This could take days unless you can move it into a heated garage. If your car overheats a few miles from home, it’s likely that the radiator has frozen. Stop immediately so you don’t cause more serious damage to the radiator and the rest of your car. Clean your windscreen both inside and out. Keep your windscreen and other windows clear from dirt, snow and stickers, to avoid a reduced visibility and a fine. Clear snow from the roof as it can fall onto the windscreen and block your vision whilst driving. Air-con demists your screen quicker and minimalises condensation. Replace worn or damaged wiper blades as they would be no use in severe weather conditions. Don’t leave your wipers on when you have parked up. If the blades freeze to the screen, you could damage the blades and the wiper motor when you turn the ignition on. Use a suitable preservative in your screen wash to reduce the chance of it freezing. If the roads are really muddy, clean your lights after every trip. If you have to clear snow, don’t forget the lights at the front and back. Use headlights when visibility is seriously reduced. If you use fog lights, remember to switch them off when visibility improves so they don’t dazzle other drivers or obscure your brake lights there is nothing worse than cars driving in the opposite direction at full beam. Have at least 3mm of tread for the winter. ABSOLUTELY DO NOT let air out of your tyres to get more grip – it’s a myth! It doesn’t work, and it’s unsafe and you could have a serious accident. Speeding is not just inconsiderate driving… it contributes to the 36,000 serious injuries and 3,000 deaths that occur on Britain’s roads each year. More than two thirds of all accidents in which people are killed or seriously injured happen on roads where the speed limit is 40mph or less. At 35mph you are twice as likely to kill someone as you are at 30mph. Many people believe that the average temperature in the UK is too warm for winter tyres to be effective but this is actually a common misconception. Winter tyres are made so that they don’t harden when the temperature drops and they are effective at any temperature below seven degrees.